Caravan Clubs: Go Motorhome - find the right caravan club for you. A new magazine from the publishers of MMM launched in August 2009. 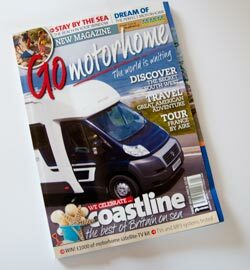 This magazine is aimed at relatively new owners looking for ideas of where to go and what to do in their motorhome. It provides helpful beginner advice and stimulating holiday ideas. There are also aspirational motorhome tests to provide you with ideas for your next step up the motorhome owning ladder. Look inside and you’ll find brilliant features on exciting places to go in Britain and abroad. We test the latest motorhomes, and throughout we’ll be cutting out the waffle to tell you what you really need to know. can you please let me know when the 4th issue will be available and how i can obtain it. i live in the republic of ireland. thank you very much.